For the last four Monday nights, I attended a cooking class called “Essential Cooking & Cutting Techniques for the Vegan, Vegetarian, and Flexitarian” at the Natural Gourmet Institute in New York City. Chef Elliot Prag taught us some great techniques and helped me sharpen my knife skills. He also confirmed that I do a lot of things right already! Phew. The school kitchen was stocked with everything we needed at our fingertips. Lots of bowls and spoons and students who prepped and cleaned up after us, which made cooking especially joyous. We worked in groups of 4 or 5 and, at the end of each session, sat down as a group to eat the food we just prepared. White vegetables, like potatoes, onions, cauliflower, cabbage, cucumbers, and zucchini stay white in acid (like lemon juice) and turn yellow in salty water. To keep them white add a little lemon juice to the cooking water, but not too much to toughen the vegetable. Red/Purple vegetables, like red cabbage and beets, keep their color best when cooked with a small amount of acid. Too much salt turns them blue. Green vegetables, like all leafy green vegetables, stay green with salt, not acid. Protect them with salt. Yellow/Orange vegetables, like carrots, corn, winter squash, sweet potatoes, tomatoes, and red peppers, are very stable and are not really affected by either acid or salt. This is what I usually do but wanted to write it down here: toast nuts in the oven for even toasting. Toast seeds in a skillet on the stove top. Pine nuts are the size of seeds, so toast on the stove top. To “braise” means to cook in a small amount of liquid which is a technique for keeping food tender. Now I have a professional name for how I cook tempeh. Store potatoes in a cool, dry, dark place. If stored in plastic bags, they will sprout and rot. And, don’t store near onions because they give off a gas that can hasten sprouting. Good to know! 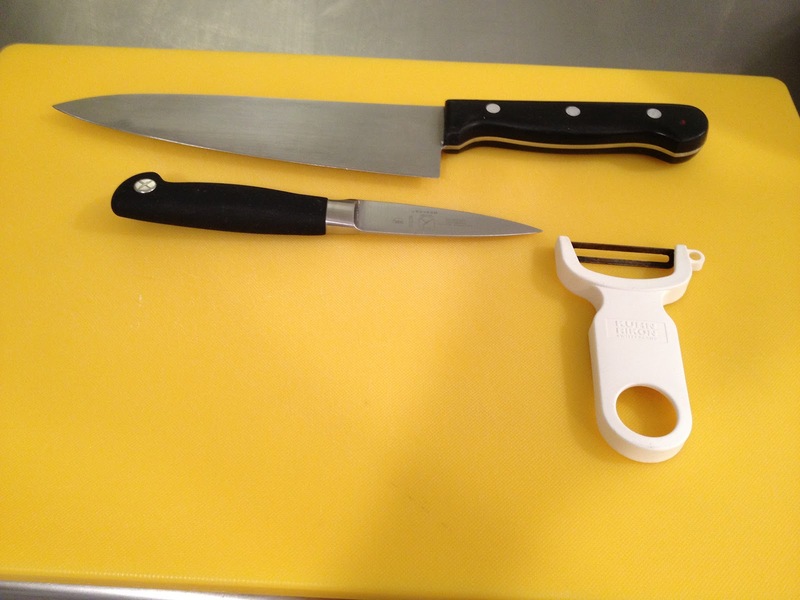 Sharp knives should cut through paper. I will sharpen my knives more often. After chopping garlic, rub your fingers on something stainless steel to get the garlic smell off! All in all, I learned a lot, made some new friends, and got a few new recipes to put into rotation. New posts coming soon! Thanks for the info…BTW I want you to know that I get several vegan blogs but yours is the one I enjoy and look forward to the most…keep up the good work! thank you SO much! let me know if you have any questions…happy vegan cooking! I agree with Marsha. I learn so much here and really appreciate your efforts posting with your busy schedule. Thanks so much!